Start practicing with your friends to get ready for future League play. Dates and times available soon! If you're interested in improving your game in a non-intimidating atmosphere, our pros offer lessons and classes for players of all skill levels. All 1st, 2nd and 3rd place team individuals are required to fill out a W9 tax release form. All teams will play stroke play against the entire field each week for the duration of the regular season. In the 2-person leagues, two teams will play as a foursome within the same bay. Each player will hit five shots and then alternate with the other three players in the bay. The same rotation should be maintained throughout each game. Scoring will be based off of the cumulative, individual scores from all members of a team. The individual scores will be composed of each games gross score plus each player’s respective handicap (see Handicap explanation below for details). Points for each week are awarded to teams based on the highest cumulative scores from the entire field. Total points allotted are based on the number of teams participating in the league. For example: If there are 20 teams in the league, the team with the highest total score at the end of play will be awarded 20 points. The team with the second highest cumulative score will be awarded 19 points. In the case of ties, teams will be awarded the same amount of points. The next place team(s) will be awarded points based on their position in the field, not ranking. For example: If there are 20 teams in the field and two (2) teams are tied for the third best score, both teams will be awarded 18 points for their play that week. The next highest scoring team will be awarded 16 points, as they had the 16th highest score that week. Standings will be based off of total points accumulated throughout the 6 weeks of regular season game play. Standings will be updated and posted weekly. If for some reason a ball does not register, a ball edit may be made to the outer most ring of the target. All teams are eligible for playoffs. Playoffs are single elimination, starting the 7th week of the season. Teams will be seeded according to the season standings. Depending on the size of your league, there may be multiple playoff flights. The first two rounds of playoffs will be played week 7 with semifinals and Championship matches played week 8. WHAT IF I CAN'T MAKE A ROUND OF THE PLAYOFFS? In the event that a team or player cannot make a round of the playoffs, the team or person needs to contact the Topgolf league manager listed below to set up a makeup. The makeup needs to be completed before the scheduled night of the playoff. No later makeups will be accepted. However, the scoring for the makeups will be handled differently. The player(s) will incur a 10% reduction to their total score and the game must be witnessed by a Topgolf associate. A printout of your score will be attached to the scorecard. Handicap will be based on scores from the league play only. The first night of competition will be a blind matchup with the handicap based solely on league scores from the first night that will be retroactively calculated into the scores. Handicaps are calculated by taking the players score, minus the par of the particular game, then divide that number by the specific game multiplier. From there each player receives 80% of that index. For example: Player A shoots 150 in Topgolf. The Topgolf game par is 250 and it’s multiplier is 5. 250 – 150 = 100/5 =20(.8) = 16. Each game, excluding TopPressure, will have an overall effect on the handicaps applied to each game. Handicaps will continue to evolve from week to week during the regular season based on all games played through out the season. Handicaps will be provided to league players at the beginning of their match each week, beginning in week two. The maximum handicap will be 30 for league competition. CAN I HAVE ALTERNATES ON THE TEAM? Teams can have multiple alternates who fill in on dates that other team members aren’t available. The alternate must have played at least 2 games of Topgolf in the past so a handicap can be calculated, or they will play at a 12 handicap. Once a player has league scores posted, only league scores will be used to calculate their handicap. If a team’s alternate is not available and the team only has 1 player that week, then the missing player will receive a score of zero. However, the player(s) that do show will be able to still play and earn points. As mentioned, every point counts. An alternate may not be used for the playoffs unless they have played in at least TWO regular season matches in the current season. A team will not be allowed to have more than 10 different players on their team throughout the course of a season. If a team is not able to find a former replacement and has reached the 10 person limit, the team will take zero points for the missing position. ¹ Prizes vary by location. 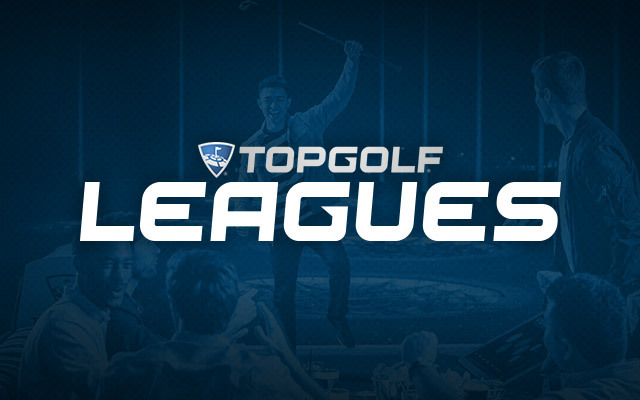 Please check with your Topgolf league manager on the first night of play. The chance to win is free for league members, and no consideration is required. Must be 13 years of age or older to participate.